LA PAZ, BOLIVIA. 2010 - PRESENT. In the summer of 2010, the IDC, with Bolivian non-profit partner Creativo Cultural Espacio, began a collaborative design effort with kids working on the streets of La Paz in order to generate new, street-based versions of education that more adequately fit the unique lifestyle of these children. Unlike current school systems, which demand the kids choose between working (and thus eating) or pursuing their education, the IDC’s street-based educational system is designed in a manner that allows each child to pursue learning in a manner congruent with their schedule, circumstances, lifestyle, experiences, and interests. 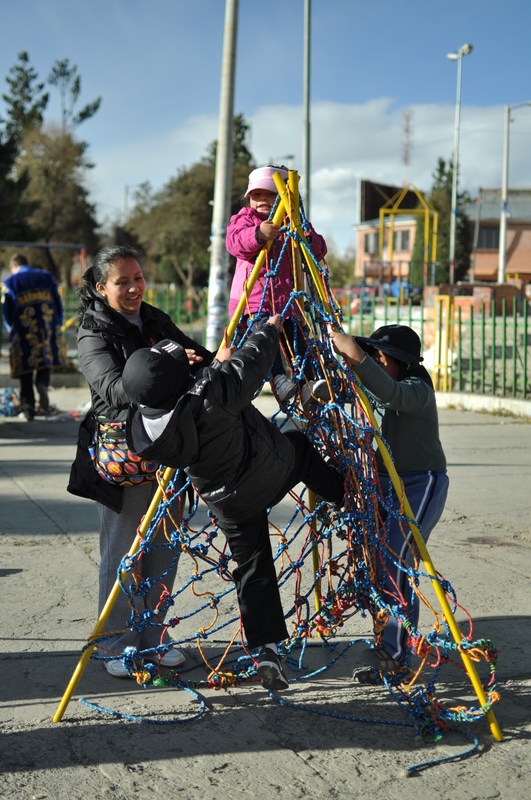 Installed within the Bolivian streetscape over the course of several years, these small, simple event- and space-making devices were designed to provoke, measure and react to the responses of both the children and others who might one day occupy, possess, or evolve a street-based educational system. VENDINGeducation LARGE, creates micro-schools within the architecture of the vending booth, offering a light-duty center of education within key neighborhoods. As these event-spaces propagate, the costs and potentials of each overlap, creating a networked series of educational opportunities and architectures that are hardwired to the rigors of life on the street. Already this evolution has resulted in the creation of several classroom-scaled assets: the El Alto Makerspace, which brings metal-, wood- and fabric-working equipment, as well as a small-scale CNC router, and the educational and vocational opportunities thereby realized to the citizens of the fringe settlement of El Alto; park-in-a-Cart, which uses a mobile park platform to create social condensers in fringe settlements and realize playful, arts-based educational opportunities and the Mobile Cantina and Culinary Institute, which celebrates native Bolivian agriculture and local methods of cooking through various pop-up educational initiatives, including free cooking workshops, community kitchens, and street-festivals. EXHIBITIONS include: “Spontaneous La Paz” at the San Francisco Museum Of Art in La Paz, Bolivia (2011) and “Medium Resistance” at the Crane Gallery of Philadelphia, PA (2010). PUBLICATIONS include works by: Structures for Inclusion (2015), the Association for Community Design (2014), the Sixth And Fifth International Symposia On Service Learning In Higher Education (2015 and 2013), the International Council For Research And Innovation In Building And Construction (2011), and the Design Altruism Project (May 5, 2011). PARTNERSHIPS: The International Design Clinic, Lawrence Technological University, Temple University, the Universidad Catolica Boliviana, Gustu, Creativo Cultural Espacio and Teatro Trono.